Mitsuko — Piano. Push. Play. Painting a piano for Piano. Push. Play. was a wonderful way to create visual art with an unusual object. Deciding how to approach this project challenged me to think differently, and ultimately create something that is divergent from the type of work I usually make. Being from a family of musicians, there was always music flowing through the house and I wanted to find a way to represent that feeling, how music surrounds and envelops you. The way that a school of fish move through water with a graceful synchronization is like the way the keys from a piano join together to create a beautiful melody. 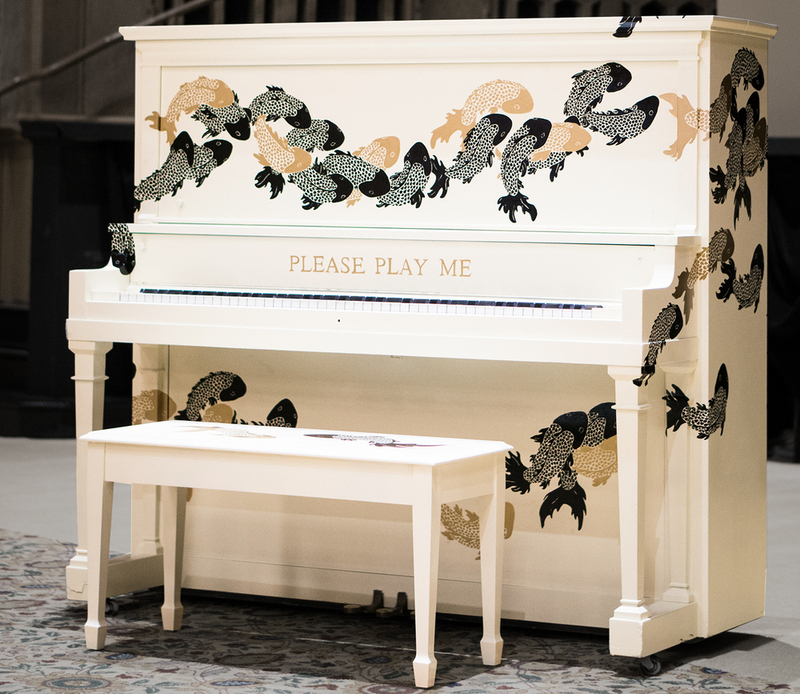 The koi on my piano swim around the keyboard inviting the player to join them. It was a real pleasure to work on this creative endeavor. Susannah Kelly is a painter and drawer currently practicing in Portland, Oregon. She often draws on the human figure as a source of inspiration for her work. Working primarily in graphite, her subject matter deals with the brutality of human relationships, both with others and in ourselves. She owns and curates antler gallery in the Alberta Arts District of Portland. Dame Mitsuko Uchida (20 December 1948) is a classical pianist, born in Japan and naturalized in Britain. She has appeared with most of the world's foremost orchestras, recorded a wide repertory with major labels, won numerous awards and honors (including Dame Commander of the Order of the British Empire in 2009), and serves as co-director of the Marlboro Music School and Festival. In recent years, she has also conducted major orchestras. She is an acclaimed interpreter of the works of Mozart, Beethoven, Schubert, Chopin, Debussy and Schoenberg. She has recorded all of Mozart's piano sonatas (a project that won the Gramophone Award in 1989), and concerti, the latter with the English Chamber Orchestra, conducted by Jeffrey Tate. Her recording of the Schoenberg Piano Concerto with Pierre Boulez won another Gramophone Award. She is further noted for her recordings of Beethoven's complete piano concerti with Kurt Sanderling conducting, Beethoven's late piano sonatas, and a Schubert piano cycle. She is a distinguished interpreter of the works of the Second Viennese School. Her 2009 recording of the Mozart Piano Concertos nos. 23 and 24, in which she conducted the Cleveland Orchestra as well as playing the solo part, won the Grammy Award. This recording was the start of a project to record all the Mozart piano concertos for a second time, conducting the Cleveland Orchestra from the piano. Further recordings for this project were released in 2010, 2012 and 2014. Note: If you want to visit this piano, please contact the location. Many of our forever homes are not open to the public or are open only during certain hours.